I’m attending the SharePoint Conference 2014 #SPC14 in Las Vegas! It is a very special day for me today – ClearPeople have just approved my trip to attend the SharePoint Conference 2014 (#SPC14). Thank you thank you thank you! Each time the conference comes around I’d try to make a business case or as in recent weeks, plead to attend but for various reasons it has never been possible. This year however the answer was yes! It’s been a long wait but I think this is for the better – I have now far more experience with SharePoint than ever and feel that the company and I will gain more by attending this time round. My focus has shifted and I will no longer be attending the conference with just SharePoint in mind but instead with SharePoint, Cloud & Windows Azure, Office 365 & SharePoint Online and Yammer to think about! Discovering what the next big thing for SharePoint might be? I will be blogging about the conference no doubt before, during and after the event – you can follow all of this content with this tag #SPC14. The fun of organising this trip now begins! 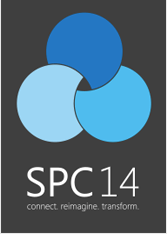 Next Next post: All #SPC14 sessions available in a single spreadsheet!